Becomes Leader of the Zionists. Leader of political Zionism; born in Budapest May 2, 1860. Herzl settled in Vienna in his boyhood, and was educated there for the law, taking the required Austrian legal degrees; but he devoted himself almost exclusively to journalism and literature. His early work was in no way related to Jewish life. He acted as correspondent of the "Neue Freie Presse" in Paris, occasionally making special trips to London and Constantinople. His work was of the feuilleton order, descriptive rather than political. Later he became literary editor of the "Neue Freie Presse" (which post he still holds). Herzl at the same time became a writer for the Viennese stage, furnishing comedies and dramas. From April, 1896, when the English translation of his "Judenstaat" appeared, his career and reputation changed. Herzl has not confessed to what particular incident the publication of his "Jewish State" (see Zionism) in the winter of 1895 was due. He was in Paris at the time, and was no doubt moved by the Dreyfus affair. His forerunners in the field of Zionism date through the nineteenth century, but of this perhaps he was least aware. Herzl followed his pen-effort by serious work. He was in Constantinople in April, 1896, and on his return was hailed at Sofia, Bulgaria, by a Jewish deputation. He went to London, where the Maccabeans received him coldly. Five days later he was given the mandate of leadership from the Zionists of the East End of London, and within six months this mandate was approved throughout Zionist Jewry. His life now became one unceasing round of effort. His supporters, at first but a small group, literally worked night and day. Jewish life had been heretofore contemplative and conducted by routine. Herzl inspired his friends with the idea that men whose aim is to reestablish a nation must throw aside all conventionalities and work at all hours and at any task. In 1897, at considerable personal expense, he founded "Die Welt" of Vienna. 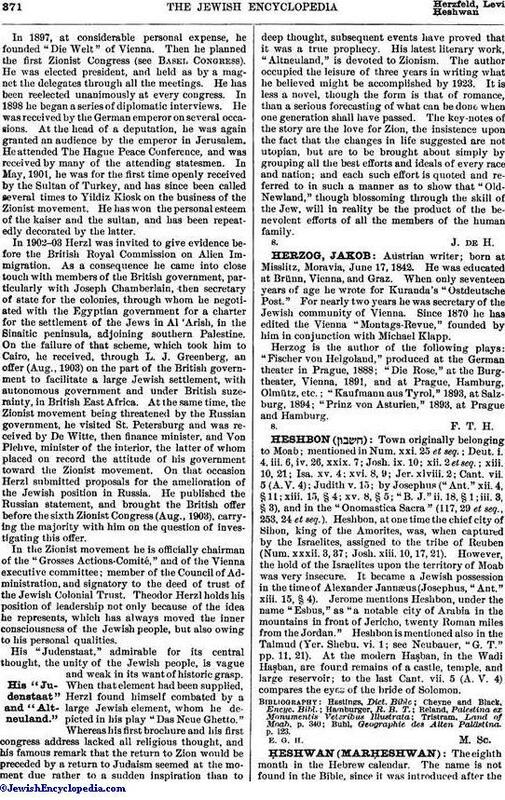 Then he planned the first Zionist Congress (see Basel Congress). He was elected president, and held as by a magnet the delegates through all the meetings. He has been reelected unanimously at every congress. In 1898 he began a series of diplomatic interviews. He was received by the German emperor on several occasions. At the head of a deputation, he was again granted an audience by the emperor in Jerusalem. He attended The Hague Peace Conference, and was received by many of the attending statesmen. In May, 1901, he was for the first time openly received by the Sultan of Turkey, and has since been called several times to Yildiz Kiosk on the business of the Zionist movement. He has won the personal esteem of the kaiser and the sultan, and has been repeatedly decorated by the latter. 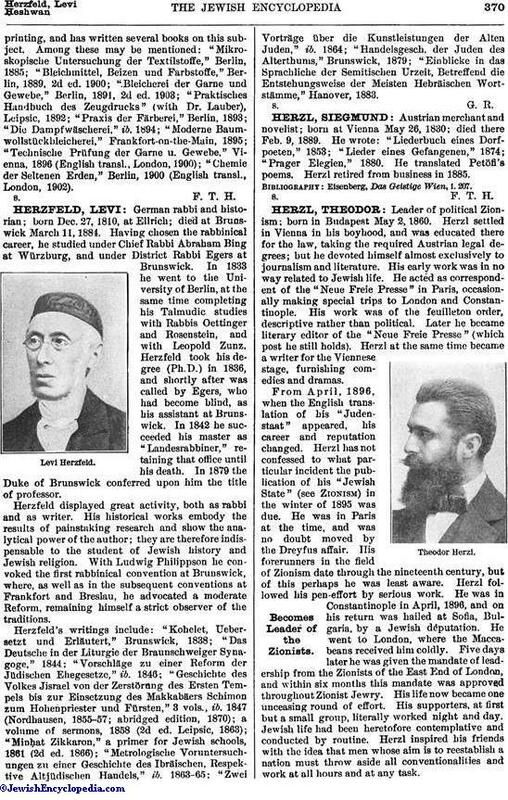 In 1902-03 Herzl was invited to give evidence before the British Royal Commission on Alien Immigration. As a consequence he came into close touch with members of the British government, particularly with Joseph Chamberlain, then secretary of state for the colonies, through whom he negotiated with the Egyptian government for a charter for the settlement of the Jews in Al 'Arish, in the Sinaitic peninsula, adjoining southern Palestine. On the failure of that scheme, which took him to Cairo, he received, through L. J. Greenberg, an offer (Aug., 1903) on the part of the British government to facilitate a large Jewish settlement, with autonomous government and under British suzerainty, in British East Africa. At the same time, the Zionist movement being threatened by the Russian government, he visited St. Petersburg and was received by De Witte, then finance minister, and Von Plehve, minister of the interior, the latter of whom placed on record the attitude of his government toward the Zionist movement. On that occasion Herzl submitted proposals for the amelioration of the Jewish position in Russia. He published the Russian statement, and brought the British offer before the sixth Zionist Congress (Aug., 1903), carrying the majority with him on the question of investigating this offer. In the Zionist movement he is officially chairman of the "Grosses Actions-Comité," and of the Vienna executive committee; member of the Council of Administration and signatory to the deed of trust of the Jewish Colonial Trust. Theodor Herzl holds his position of leadership not only because of the idea he represents, which has always moved the inner consciousness of the Jewish people, but also owing to his personal qualities. His "Judenstaat," admirable for its central thought, the unity of the Jewish people, is vague and weak in its want of historic grasp. When that element had been supplied, Herzl found himself combated by a large Jewish element, whom he depicted in his play "Das Neue Ghetto." Whereas his first brochure and his first congress address lacked all religious thought, and his famous remark that the return to Zion would be preceded by a return to Judaism seemed at the moment due rather to a sudden inspiration than to deep thought, subsequent events have proved that it was a true prophecy. His latest literary work, "Altneuland," is devoted to Zionism. The author occupied the leisure of three years in writing what he believed might be accomplished by 1923. It is less a novel, though the form is that of romance, than a serious forecasting of what can be done when one generation shall have passed. The key-notes of the story are the love for Zion, the insistence upon the fact that the changes in life suggested are not utopian, but are to be brought about simply by grouping all the best efforts and ideals of every race and nation; and each such effort is quoted and referred to in such a manner as to show that "Old-Newland," though blossoming through the skill of the Jew, will in reality be the product of the benevolent efforts of all the members of the human family.